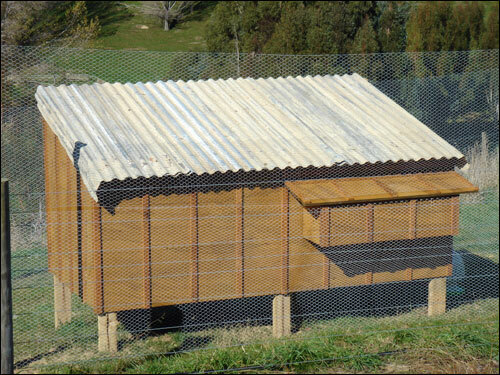 Our new laying hens arrived last week so I spent a few days building them a new house and enclosure. They seem to like their new accommodation and hopefully their appreciation will be in the form of lots of eggs. I designed the house to be made from 4 sheets of 15mm plywood and there were only a few scraps left over. The legs allow the chickens to shelter underneath from sun or rain and will hopefully stop any rats setting up house under the coop. 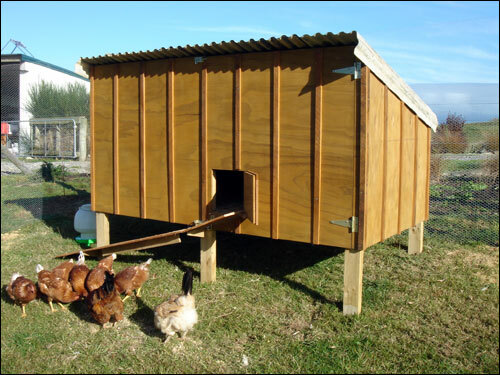 The front opens right out for easy cleaning and the nesting boxes at the back are accessible from outside the fence. Hopefully it will be easy to grab eggs each morning without disturbing the chickens. The disabled access ramp is for our dodgy old rooster who limps a bit. The battens on the ply were a bit of an afterthought – I put a couple on to cover joins, then had to keep going to make it all match. A coat of stain to protect the wood, and it was done. The final touch will be some green roof paint to match the house and shed (luckily the previous owners left some behind). I really like the design of your chickenopolis. It would be great if you included some dimensions and interior pictures. I really enjoy your blog, Keep up the great work. Thanks Roger. I have a rough plan that I have been meaning to tidy up but in the meantime I hope this helps: It’s made from sheets of 1200×2400 ply and I tried to minimise cutting so the dimensions are 2400 wide by 1200 deep by 1200 high at the front and about 800 high at the back. The battens are at 300mm spacings so you can work out more measurements . I’ll get some more photos posted soon. Thanks for the update I look forward to the pictures. This info is helpful though.